I grew up on the first defence line and as a kids we've been exploring bunkers and digging. Adults never minded us to do this, only warned of two things. If there is mine, we should call for sappers, if human bones we should cover them with the earth. An ancient Greek Sophocles adviced the same. Bury dead, he said, if can not bury, at least throw a handful of earth. Finally, common sense tells not to disturb peace of dead and we don't. 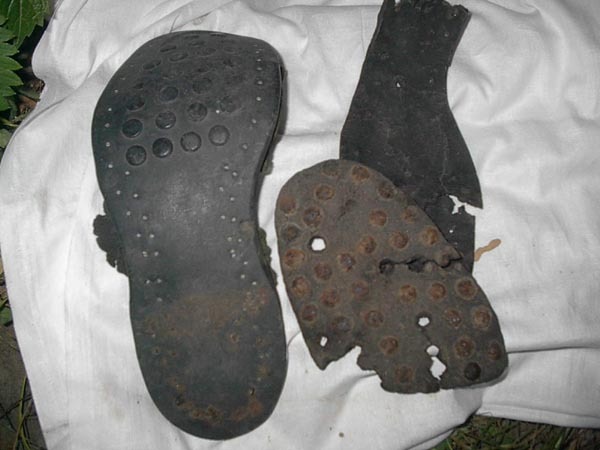 Here boots of soldiers, we found them in a trenches, I believe, rain wash them away, bones have been there, sticking out, white human bones and we did as Sophocles said, we burried them. 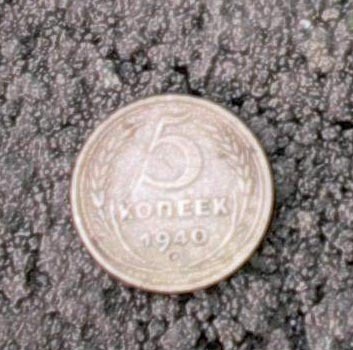 Soviet five-kopeck coin, some one might carry them for a luck. A chances to identify a Soviet dead in Bukrin almost non existant. Most part of 300.000 Soviet people who died here have been a civilians. As I said, it was a fictitious attack with mock ups of tanks, dummies and even fake landing strip. It's like in a movie, all fake, only people are real and they needed a lot of people for this crowd scene. Civilians were mostly guys from liberated villages and towns. They wore a black padded jackets and got a name a black shirts. Half of them had no rifles. Ones with the rifles were ahead and when they died, the other picked up their arms. The figure of 300.000 is a rough estimate, no one ever register a civilians.